This is part of a series of interviews with software developers and engineers without a formal CS degree. We’ll look at how they got to where they are today and their advice to people looking to make a career in software development. 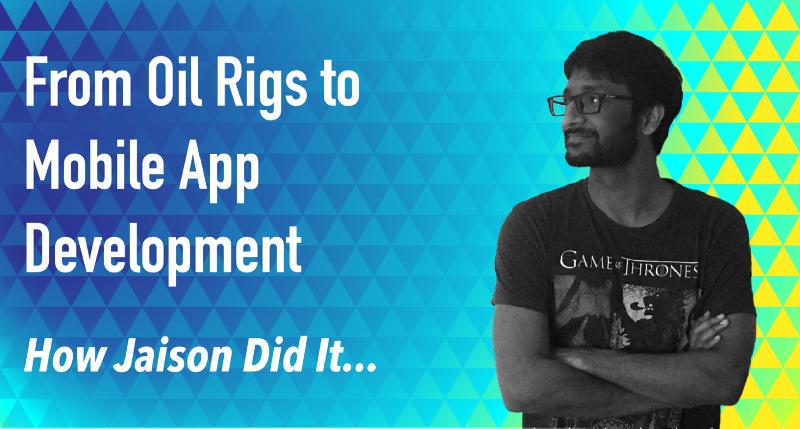 Jaison Titus started his career working on oil rigs, taught himself how to code and is now in charge of all things mobile at Hasura. He talks about what it took to get here. Hi Jaison, could you tell us a little about what yourself? Hey! Currently, I head mobile development at Hasura. It’s a platform that deploys cloud backends instantly. It’s front-end agnostic and my job is to make it work well with mobile apps. I started out building the iPhone and Android SDKs for our data, auth & file APIs. Now, I’m working on boilerplates or app templates for developers to get started quickly. I also contribute to the Hasura CLI tool and API console, and helped out with creating the mobile app development related content for IMAD, a MOOC on application development we run along with IIT Madras. I studied E.E.E in college after which I joined Halliburton as a perforation specialist; I worked with the explosives and machinery used for the initial drilling that commences once oil has been discovered somewhere. Between graduating from college and joining work, I had a few months off. I decided to use this time to learn how to build Android apps. I didn’t have any grand plans; it was 2014 and everyone was building an app. I just went with the flow. Even after I started working at Halliburton, I continued to work on my apps during any free time I had. Working the rig job and building apps side by side made me realise quickly that I’d rather be in software development. After about 6 months, I’d built 2 apps and had enough confidence that I could pursue this as a career. I quit Halliburton. I landed my first coding job through pure HUSTLE®. I struck up a conversation with someone at a coffee shop and this guy turned out to be the owner of an app development company. He was looking out for Android devs and I joined as the lead developer working on a Flipkart clone for a client. Later, he put me in touch with a friend of his who was building a networking app called Levo. I joined them as the interim CTO handling everything from product decisions to hiring a tech team. Levo was built using Hasura on the backend . At the time, Hasura was still in Beta and I ended up working closely with Tanmai (Co-founder, Hasura). I found the work at Hasura really interesting and as soon as my contract with Levo was up, I joined Hasura as the Mobile Lead. How did you pick up coding without having a formal CS degree? Most of what I know about app development was self-taught. I literally just googled “How to build an Android app” and read whatever blog post came up and went from there. If I got stuck at a particular place or I needed to build some specific feature I would just google “How to X” — there would always be some advice on how to do it online. My first commercial project followed the same learn-on-the-go pattern. The Flipkart clone required working with API calls, animations, and required backward compatibility, concepts I’d never worked with before. To make things more challenging, I had deadlines to meet. Again, Google came to my rescue. I was coding and learning side-by-side. Did not having a CS degree worry you? At times it can be a bit intimidating; concepts that are elementary to CS grads were not known to me. Overcoming this is just a matter of initiative and perseverance. If you had to start from scratch, would you do anything differently? Heh, I’ve not given this much thought. I dunno, invested in bitcoin maybe 🙏? In all honesty though, I’d probably go back and do a CS Major. Not because it’s necessary for working in the industry; if you’re motivated enough, you can manage fine without it. I just really enjoy the subject a lot. What would be your advice to someone who wants to make a similar career shift, or get into software without a CS degree? First off, when you work in software you’ll come across people without CS degrees in really high positions and with great careers. So right off the bat it is possible and can be done. But a word of caution. I didn’t just jump into this blindly. I’d actually built 2 apps over 6 months before quitting. I knew what I was getting into, and I was ready to put in the work to figure things out. The advantage with software development is that you can learn how to do it on your own and work on projects in your spare time. This means that you can get exposure to the day-to-day activities of a software developer without having to quit your day job — this is not true of most other industries. You’ll know if this is the career for you very quickly and with no risk. Once you’re done with that, start building a few apps for yourself. Our MOOC on application development might be a good way to get started. Now that you’ve got some skills, it’s time to get out of your comfort zone and start building apps for others. Talk to your friends and offer to build software for any ideas they have for free. If your friends don’t have any ideas, look out for entrepreneur meetups in your city. You’ll find tons of aspiring entrepreneurs who’ll love to get their apps built for free or next to nothing. It’s a great way to get experience, work with different technologies and perform against a deadline. The reason I recommend doing free work is because your goal is only to figure out if this career is for you — real-life projects to work on are all you’re looking for. I recommend you get started with web apps instead of mobile apps because web development exposes you to a much broader spectrum of software development. You can always pick up mobile development as you go along. After working on a few projects you’ll have a good idea of whether this is the career for you and whether you need to attend a boot camp or get a CS degree. If you’re looking to get into application development and don’t have a background in CS or software, you should check out Introduction to Modern Application Development (IMAD). We teamed up with IIT Madras to create an online course on application development for people from a non-tech background.